Mrs. Imogene Robbins, age 88 of Fairfield, OH passed away at Bradford Place on Saturday, November 10, 2018 surrounded by her children and grandchildren. She was born in Cincinnati, OH on January 14, 1930 to James Niceley and Leanna Stokes Niceley. She was a devoted Christian and member of Victory Pentecostal Tabernacle and greatly enjoyed singing praise to God. 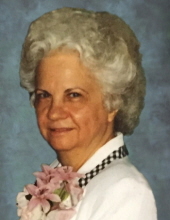 Mrs. Robbins is survived by her children, Dianna (Jerry) Walls, Douglas (Vickie) Robbins, Linda (Edward) Harper, Mark Robbins; grandchildren, Leeanna Hoover, Matthew (Trinity) Walls, Dianna (Travis) Allford, Michael (Carmela) Harper; great grandchildren, Natalie and Braiden Hoover, Logan, Brody and Abigail Walls, Cade and Addyson Harper, Noah and Caleb Allford; and a sister, Dolly Kranbuhl. She was preceded in death by her parents, James and Leanna Niceley; her husband, Denver Robbins; and a daughter-in-law, Victoria Robbins. Visitation will be held on Tuesday, November 13, 2018 from 5:00 PM to 8:00 PM at Victory Pentecostal Tabernacle, 7460 Morris Rd, Hamilton, Ohio. Funeral service will be held at Victory Pentecostal Tabernacle on Wednesday, November 14, 2018 at 10:00 AM with Rev. Donald Pierce and Rev. Rick Witt officiating. Burial with graveside services will follow Wednesday afternoon in Elmwood Cemtery in Mt. Vernon, KY. Arrangements are by Brown-Dawson-Flick Funeral Home in Hamilton, OH. Local arrangements are by Dowell & Martin Funeral Home. To plant a tree in memory of Imogene Robbins, please visit our Tribute Store. "Email Address" would like to share the life celebration of Imogene Robbins. Click on the "link" to go to share a favorite memory or leave a condolence message for the family.